The spectre of unrest hangs in the air over the Middle East like an unwelcome, immovable cloud but technology and entrepreneurialism is a less obvious, happier presence that continues to grow. Everybody knows that Israel is a startup phenomenon of course but across the entire region there are pockets of change as smart people build technologies and tech-enabled companies to make life simpler and better for local citizens and those beyond. Some of the hotspots are in the very countries that have been most troubled recently: think especially, perhaps, of Egypt. Others have prospered because of their relative stability, such as Jordan and the United Arab Emirates. The flowering of those startups should be something to behold. One of the most notable is Souq.com, the self-described “online megastore” of the UAE and its surrounding region. Founded in 2005, Souq this year raised $75m in a one of the biggest ever funding rounds for a Middle Eastern internet company and it continues to grow in multiples annually. In 2015, we’re likely to see Souq expand sales geographies and with internet usage in the ME growing at about 40% per year and e-commerce sales growing at a similar rate, an IPO could come for Souq sooner rather than later. If that float does occur, it could do for awareness of the Middle Eastern e-commerce sector what Alibaba has done for China - or at least what Mercado Libre has done for Latin America. Another closely watched company is B2B marketplace Search In MENA, itself often compared to parts of Alibaba. Once again, this directory has the chance to grow and establish itself as a local powerhouse and phenomenon. In terms of the broader issues, the banking sector will need to address Basel III compliance requirements, the Islamic, Sharia-compliant ethical banking opportunity, hacking/hacktivism and the surge in demand for mobile banking. 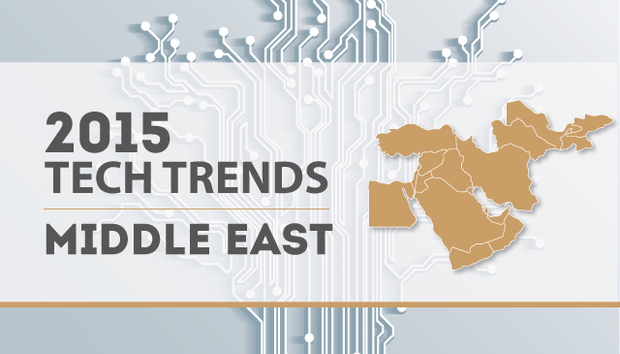 Next year will also see a rise in the prominence of the Middle East as a destination for global technology events. In October this year, Cisco announced that Dubai will host the Internet if Things World Forum in 2015 – and of course Dubai will continue to build up to 2020 when it hosts the World Expo. The progress of these companies will be fascinating to observe and the burgeoning ecosystem in the Arab world, in the US and outside that helps these companies to internationalise will be stress-tested to the maximum. And as for the Israeli phenomenon, all eyes will be on the 2015 general election and the latest crop of terrific pre-IPO startups, like adtech/content phenomenon Outbrain, emanating from there – that’s a rare certainty in a region that is uniquely unpredictable.